Hello Friends, I have a card and a little embossing story for you! Before I head over to my Throwback Thursday, it’s time for another Challenge over at Seize the Birthday. 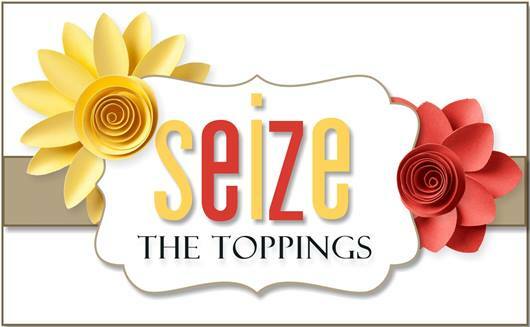 This time around our topping is Embossing. You may use any type of embossing you like, Dry with and embossing folder, Heat embossing with versa mark and a heat gun, or any other type of embossing that I haven’t mentioned. Speaking of any other type….. My hubby before I got into card making myself, use to make his own thank you cards using an embossing technique of his own. He would dampen a piece of watercolored paper by sticking it in a sink full of water, then he would pull it out to dry on a towel to where it was damp and no longer dripping. Then he would take the paper and lay it over the stencil (that he made) and press ever so slightly through the stencil as to make a raised impression using the back nub of a paintbrush. He made some cards with the sentiment raised on the outside front of the card, sometimes he would do the opposite and have the impression going inwards on the front of the card. When it came time for our wedding invitations, we were frugal okay poor, we decided to make our own Wedding invitations with this embossing technique. Okay, don’t laugh, back then we sure thought they looked awesome. 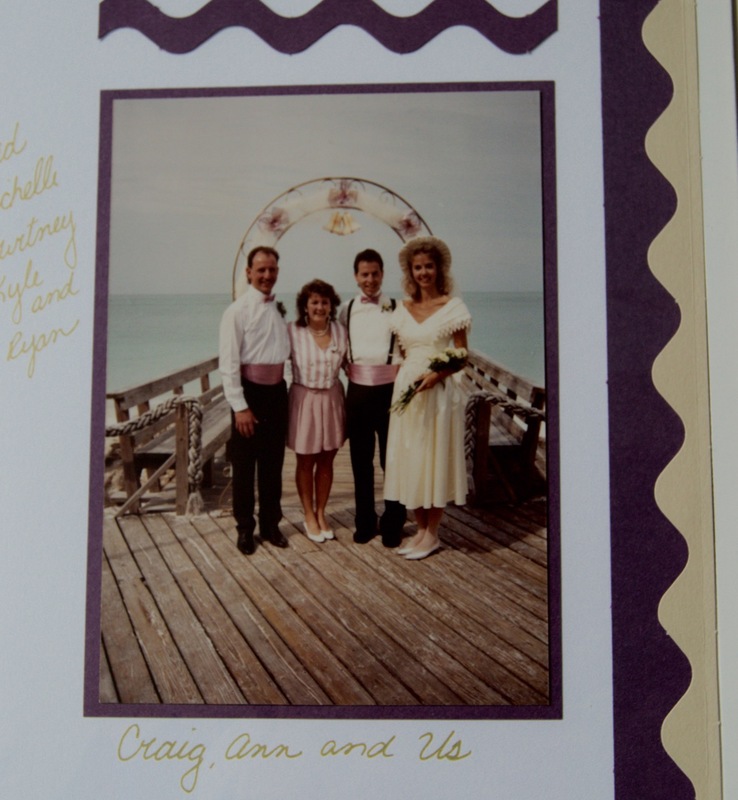 We were getting married at the beach at 9 AM on a Sunday on the deck of a restaurant that was owned by a family member to my boss at the time. So we decided to have the invitation mimic what it would actually look like where we would be standing at the time of the wedding. You will see what I mean in the photos below. Sorry for the quality of the photos I was to lazy to take them out of the scrapbooks and they have page protectors over them as well. 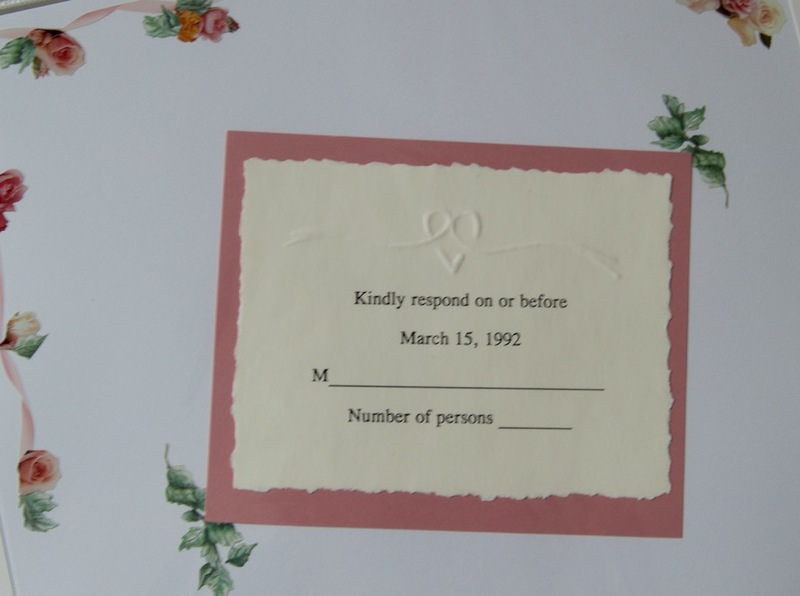 Even the inside response card had a bit of embossing on it as well. See how the card looks like the photo. since it was after all 9AM. I so appreciate you sticking with me down memory lane. By the way, hubby and I have been married for 23 years now to put the photos into perspective. I am also linking my card up to the Viva la Verve week 3 sketch where all my inspiration began.! I thought this sketch was awesome! If you haven’t noticed I really adore the Poppy Birthday Set from Verve and I also have been kinda enjoying doing some heat embossing with some ink resist over top. I think this is my 3rd card as of late with this technique. So, So Fun! The Chevron piece across the top was made with some Washi tape and my SU Envelop Punch Board. I don’t use this tool enough. The base was started out on a piece of white card stock and I used 2 SU inks to blend together to get the results I was happy with. Any other questions just let me know. 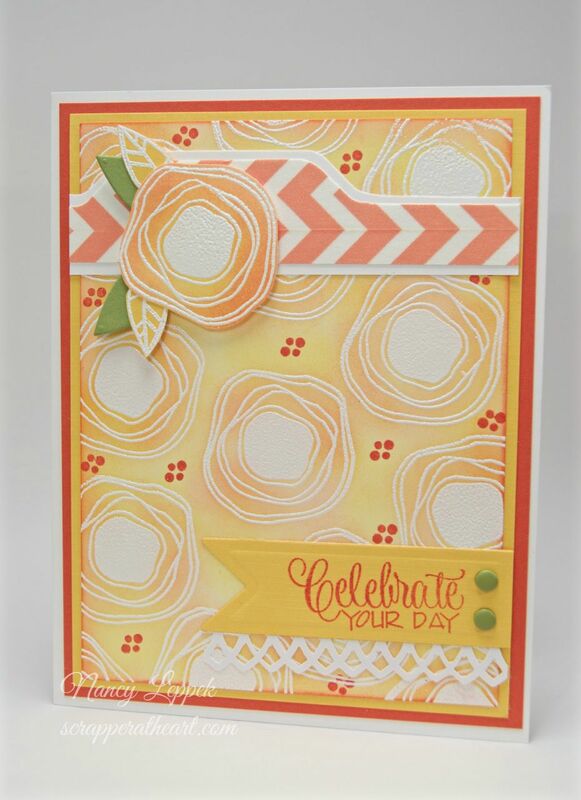 Categories: Cards | Tags: Card making, embossing, Happy Birthday, rubber stamps, sketch challenge, Verve Stamps | Permalink. Wow, I enjoyed your embossing story. The inivitation was beautiful. I think you did a fabulous job with it, with your layout and with your beautiful card too. Love it. Love the Verve Poppy Birthday stamps too. 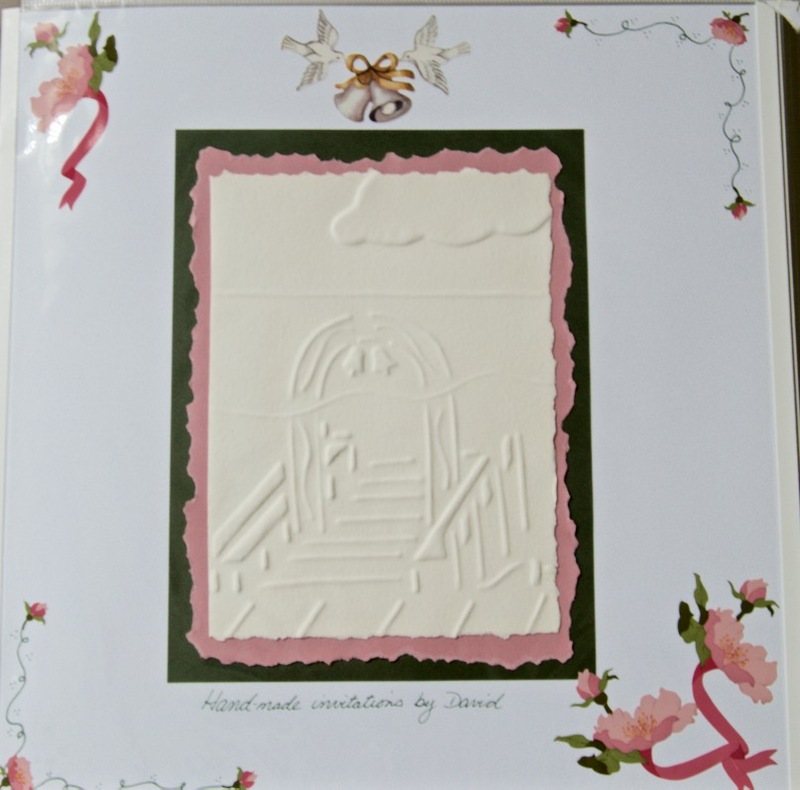 I so enjoyed reading about your DH’s handmade embossed cards! Wow! Talent runs in the family! 🙂 Your poppy card is so bright and pretty…definitely something to brighten the recipient’s day! Oh, and congratulations on 23 years of marriage! That is wonderful!! What a great story! Beautiful card as well! This card is so gorgeous! Love the depth you’ve created and I also loved your story. What a fun post! Love that gorgeous card and all of the wonderful color. Very interesting story about your hubby and his embossing technique. Love the wedding picture! Thanks for sharing your special memories! Oh my!!! Talk about living on the wild side …paper and a toaster just sounds super risky! I chuckled out loud when I read your message! Thanks for your sweet comment on my card and for putting a smile on my face!! Have a great week!! Hi Becca! Loved your sweet comment!! He’s a keeper ! I love the card you created for STB, Nancy. It’s so bright and cheery with those embossed scribbly flowers. I remember back when we used brass plates and a stylus to emboss. I think I had a couple of them but it was too boring for me. 😉 I’d much rather use an ef.